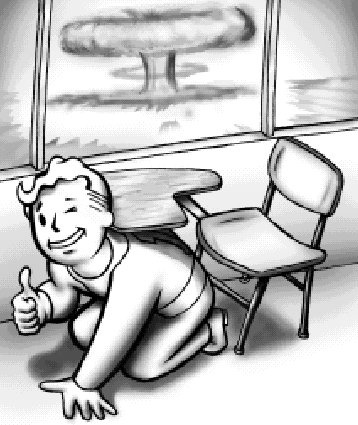 The students at Justina Road Elementary School in Jacksonville, Florida had been perfecting our “duck and cover” technique for weeks. It was 1962 and none of us was quite sure exactly what we were protecting ourselves against, but we knew that if it came we would see a flash of light brighter than the sun followed by an explosion. So whenever the air-raid siren went off, which it did often, we dutifully crawled under our desks and covered our heads with our hands. One fine autumn morning, as relations with the Soviet Union grew increasingly strained, students and teachers were loaded onto buses and driven forty miles south to the historic fort at St. Augustine, built by the Spanish in 1695. “If Russia attacks,” our principal announced as we began the tour, “we’ll come here where it’s safe.” She went on to talk about President Kennedy and Mr. Khrushchev and communism and Cold War escalation and nuclear missiles and U-2 spy planes over Cuba, none of which any of us understood. But the fort was an interesting place. Hanging out there for a while might be fun. We never had to, of course. Khrushchev blinked and disaster was averted. I’ve never been back to that old fort, though I sure would like to go. Those long-buried memories came flooding back when I learned, on the Friday after Thanksgiving, that Fidel Castro had died. Only the day before, my memory had been focused on the fall of 1969. That’s when a lovely lady who was bringing up three very lovely girls met a man named Brady, who was busy with three boys of his own. They had a hunch that this group should form a family. That’s how “The Brady Bunch” was born. I was only fourteen years old when the sickeningly sweet sitcom hit the airwaves, but I was sophisticated enough to understand that the show was a push-back against the social upheaval rocking the country. Racial tension, women’s liberation and the war in Vietnam dominated the news. But in the Brady family’s safe and tidy little world, there was no problem so big it couldn’t solved in half an hour. Which was fine by me. And every other young teen who loved the show. Maybe because we’d come of age in a time when children crouched under school desks to avoid nuclear annihilation. Maybe because we’d seen too many cops turn dogs and fire hoses on civil rights marchers. Or too many young men die in the jungles and rice paddies of southeast Asia. Maybe because we’d watched the assassination of Jack and Martin and Bobby. A simplistic, wholesome, idealized portrait of family life in America was exactly what we needed. I suppose that’s why I gave a silent cheer when I heard that Castro had died, but wept when I learned of Florence Henderson’s passing.